Whether for vocals or instruments, concerts, television or in the studio, the microphone is an elementary part of the communication between an artist and his audience. A microphone isn't just capable of converting sound into electrical impulses! no!, It can produce goose bumps, let eyes shine, or move you to tears, touch the soul and more. A microphone can also incredibly convey much emotion besides natural sound. For beyerdynamic one more reason to build the best microphones. 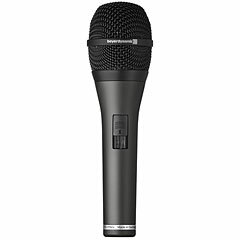 The microphones of the Touring Gear series present themselves as a complete range of products with new design and clear structure. The TG for Touring Gear follows the letter of the respective scope V for Vocal, H for headsets, L for Lavalier, D for drums, I for Instruments. The first digit indicates the respective categories, the following letter to the microphone type - D for dynamic, C for condenser and R for ribbon microphones. Additionlay S stands for models with switch. Touring Gear - the sounds hanbdcrafted from Beyerdynamic, Germany.